With the advent of LCD monitors, image flicker has become a thing of the past ... at least relatively speaking. For the most part, a screen set to refresh at 60 Hz will provide a clear and flicker free image. Some LCD monitors are a little more sensitive to outside electromagnetic interference (EM) than others. It used to be that one could change the refresh rate in the video card driver to 70 Hz or even 75 Hz to eliminate any EM interference. On the newer and larger LCD monitors this does not seem to be the case. Electricity cycles at 60 Hz. Sometimes, when the monitor is set to refresh at 60 Hz, the image will flicker. Some may never notice it, but for those of us with relatively sensitive eyes we pick it up immediately. In the case of CRT monitors, the refresh rate was the first thing to get adjusted due to the annoying characteristics of the CRT's image flickering. In this case, the monitor in question is a new Acer X243w. When the ATI driver was set to refresh at 60 Hz, there was no end to the amount of flickering in the monitor's image. But, there was no option on that monitor to bump up the refresh rate to 70+ Hz. Once the setting change was made and applied, the flickering was gone. Having the refresh rate on the monitor set to 60 Hz along with the A/C being at 60 Hz when having EM issues is a bit like having two fans, one directly behind the other, spinning at the same rate but not synchronized. One will notice the lack of synchronization in the way of a flicker. Im experiencing the same problem with the Acer x243w. When I open the Nvidia control panel to adjust the setting the my laptop (Acer Aspire 5520) goes nuts. Both monitors turn off and on and the laptop makes the sound of new hardware being connected over and over. Once I get that to stop...if I'm lucky, the x243w has the biggest ripples running through it. I shipped the laptop to Acer after trying everything possible, reinstalling the drivers, changing the refresh rate, restetting the latop setting to the oringal manufactuer setting, etc.. and they sent it back to me saying nothing wrong with the latop when plugged into an external test monitor...frustrating. I think it has to be the laptop b/c when I plaug my old dell inspiron 600 into is its perfectly fine! If anyone could possibly help me out I would apprecitate it! I'm having the same problem with my LCD (Acer x243W). 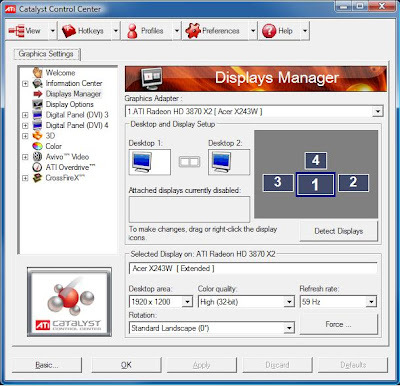 There's a way to 'force' higher refresh rates by using the button "FORCE..." in your ATI options screen (take the advanced options) but it comes at a cost; screen resolution (desktop size) will not be HD anymore but you'll be forced to be satisfied with 1680×1050. To me the flicker at 60Hz is very conspiquous and it doesn't help to take 59Hz frequency. It reminds me of the scanning effect you get if you'd watch a video recording of a CRT screen. If it's the EM interference which is causing this I'm wondering if it's interference ion the VGA cable (in that case can I protect the cable for that) or really interference on the screen? By the way if I hook up the LCD screen to my old Dell computer the thing performs fine. If you have a solution or remark you can always send it to kinjomassimo@hotmail.com. Thanks in advance!